Background: The objective of this study was to retrospectively compare results of conventional rhytidoplasty with subcutaneous detachment and plication of the SMAS, and endoscopic-assis ted subperiostal midface lifting. Methods: 61 patients, (M=2, F= 59, ages 35-59), participated. 32 underwent conventional rhytidoplasty, 29 underwent endoscopicassisted facelift. Patients were classified by the four HESTER aging types (2000). Hester types I and II comprised Group A. Types III and IV comprised Group B. Evaluation criter ia were both objective, using pre- and post-operative inferior periorbital measurements, and subjective, using plas tic surgeons that independently compared pre-and post-operative photos. Criteria were: pre-and postoperative measur ements of the inferior periorbital region, analyzed by delta value and restoration of volume and malar positioning, evaluated visually in pre- and post-operative photos. Results: In both groups, the Deltas of the distance from the inferior palp ebral rim to the blepharo-jugal ridge were more significant in the endoscopic cases. The deltas of the inferior ray of the periorbital oval were also more significant in the endoscopic cases, in both groups. Of the criteria evalua ted by the plastic surgeons, only restoration of volume and of malar positioning scored better results for the end oscopic procedure over the conventional method, with significance for both groups. Conclusion: The results in the midface were superior using the subperiost eal endoscopic-assisted method, in reduction in distance from the inferior palpebral rim to the blepharo-jugal sulc us, in restoration of volume, and in malar repositioning. Age types III and IV showed the best results, with both techniques. Midface Lift; Endoscopic Lift; Conventional Vs. Endoscopic; Facial Rejuvenation; Midface Rejuvenation; Facial Rejuvenation; Endoscopic Midface Lift. Over time, concepts of facial rejuvenation have undergone constant evolution. Current emph asis is on the preservation of expression and the natural contours of the youthful face. Today´s harmonious,compre hensive rejuvenation must deliver a natural result, without looking like a post-surgical face. In conventional rhy tidoplasty, plastic surgeons have long focused on the mandibular and neck contours . Introduction of new concep ts, such as restoration of the three dimensional volume of the face (especially the mid-third), the elimination of the naso-jugal fold, and anatomical restoration of the periorbital region, were positive contributions, offering important improvements in midface rejuvenation in the same way that current concepts in periorbital rejuvenation, including preservation of orbital fat; repositioning of the brow, the orbicularis muscle, and the orbital septum; and minimizing and filling in the area from the palpebral rim to the blepharo-jugal sulcus; have all contributed to a more natural result. Traditionally, facial rejuvenation has been addressed by conventional rhytidoplasty, with its extensive incisions, but offering excellent aesthetic results in the lower facial and cervical regions, regard ing flaccidity and restoration of the cervical-facial angle. To avoid treatment of the central region of the face, rhytidoplasty employs extended dissection, with prolonged surgical time and greater morbidity: in particular, hemat oma, nerve injury and flap necrosis. However, treatment of the lateral face is visible, with little improvement in the central oval of the face, and sometimes a volumetric flattening of the midface caused by the lateral traction of the flaps, as cited [2-6]. Techniques initially proposed [2, 7-10] presented enough problems to warrant a search for other methods. Since 1991, with the work of [11-17] attention returned to the midface, recommending itsele vation along a vertical vector, using endoscopic techniques, with smaller scars. In 2007, Saint-Cyr et al. des cribed a vertical midface lift focused on preservation of natural facial expression, maintenance of the lateral canthus position, restoration of cheek volume, and correction of periorbital hollowness. 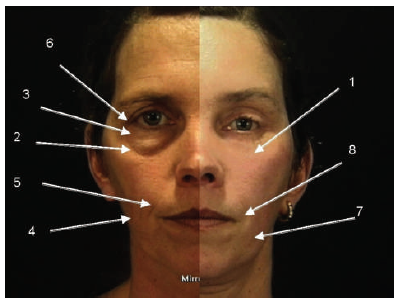 Owsley And Roberts  eloquently described the anatomical changes, including the role of levator muscular action, contributing to midface changes in features and fat. 1. Reduction in the distance between the palpebral rim and the blepharo-jugal sulcus using computerized measurements of preand post-operative photos. 2. 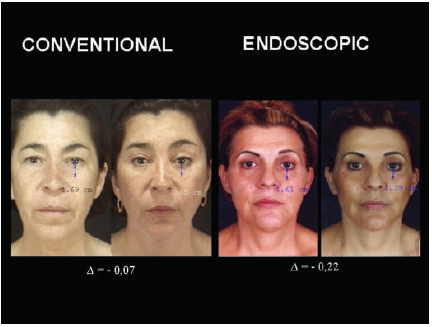 Subjective analysis of the aesthetic results by grading the preand post-operative photos, using pre-established criteria, as performed by five plastic surgeons who did not know which technique had been used. 3. Determination of the importance of the aging classification in predicting the best aesthetic results with rejuvenation surgery. 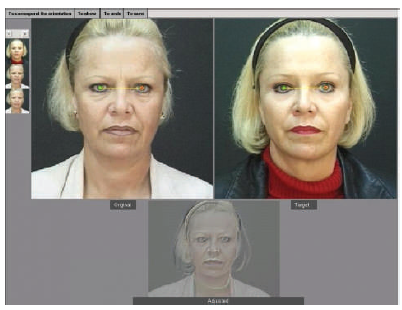 In the six years prior to this retrospective study, 349 patients underwent facial rejuvena tion surgery in our clinic, either by conventional rhytidoplasty or endoscopic face lift. Within this group,108 pat ients presented with indications for treatment of the midface. From among these 108 patients, our inclusion criter ia were: patients between 35 and 59 years of age, for whom we had photographic followup for a minimum of six month s, up to a maximum of 3 years. A total of 61 patients (58 female, 3 male) met these criteria, and of them, 32 had undergone conventional rhytidoplasty, and 29 had undergone endoscopic face lift. All procedures were performed bet ween 1996 and 2002. In the temporal region, subgaleal undermining was performed. In the mid-third, inferior and cervical regions, undermining was subcutaneous. The treatment of the deep plane, at the level of the SMAS, was made by means of plication , performed along a line from one centimeter below the earlobe up to the lateral canthal ligament, as shown in Figures 1 and 2, or by SMA Sectomy  in faces with more adipose volume. Temporal incision with subgaleal undermining was performed. The periorbital septum, in the superior, lateral and inferior portions, was dissected in the subperiostal plane, and likewise the body of the zyg oma. Subperiosteal dissection of the zygomatic arch was limited to the anterior two-thirds.Periosteal release along the inferior orbital rim was performed with golf club-shaped dissectors,Permitting dissection up to the nasal base, medially, and to the infraorbital nerve inferiorly. The periosteum was also freed along the inferior edge of the malar and maxillary rims, up to the buccal fat pad. The medial dissection was made up to the pear-shaped opening, and past the nasolabial sulcus. With a golf club-shaped dissector, the opposite side was dissected up to the later al portion, freeing the rest of the periosteum and also the ligament fibers of the masseter, at its insertion in the inferior portion of the zygomatic arch, allowing ample mobilization of the midface Systematization of the fixa tion and the elevation of the midface were designed to include three main points, allowing for a distribution of traction forces calculated to create a more enduring, stable fixation [22, 23] [Figure 1]. These three points, marked pre-operatively, were suspended by 3-0 braided nylon passed transcutaneously using a fine Casagrande needle, 20cm in length, threaded through the tip . Orbital measurements were taken of the diameter of the periorbital oval; of the inferior ray (the center of the pupil to the ridge blepharo-jugal ridge); and from the inferior palpebral rim to the blepha ro-jugal sulcus. These measurements were taken by the Mirror Suite software program, Version 6.0. 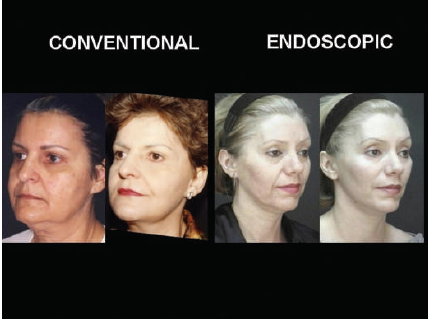 Pre- and post-operative photographs were analyzed by five plastic surgeons. For this analy sis, the images were electronically captured and standardized. 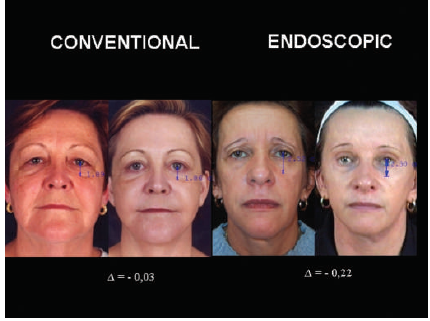 The pre-and post-operative photographs were aligned into the same position using the measurement of intrapupillary distance. The distance between the centers of the pupils was measured with patients seated, backs erect. This measurement was input into the program, which regulated the post-operative photos with the same distance and rotation of the pupillary axis as in the pre-operative photos. [Figure 2]. Figure 2: Calibration of the pre and post-operative photographs regarding interpupillary distance. The post-operative photos were compared with the pre-operative photos, without the evaluat ors knowing which procedure was performed. For each patient, grades from one through four were established for each of the criteria to be evaluated. The criteria were restricted solely to the midface (between the lateral canthus of the eye and the outer corner of the mouth). Evaluation criteria included: naturalness of result, restoration of the malar position and volume, blepharo-jugal ridge, lower eyelid flaccidity, nasolabial fold, facial flaccidity, late ral canthus of the eyes, facial shape (triangular or square), and corner of mouth [Figure 3]. Each evaluator filled out a prepared form that included definitions/explanations for the evaluation criteria. For each criterion analyzed, ratings were established from 1 to 4: Worsening = 1; No change = 2; some improvement = 3; and Significant improvement = 4. Table I itemizes the differences in the pre- and post-operative measurements of the distan ce from the inferior palpebral rim to the blepharo-jugal sulcus (D_BP), and distance from the pupil to the blepha ro-jugal sulcus(D_RAI), for each of the aging categories A and B, in relation to the endoscopic and conventional surgeries. The relationship between the surgical technique used and aging category was not significant (p>0.05), making it possible to compare the surgical techniques, independent of aging category. 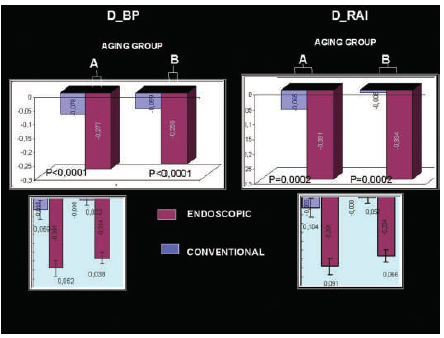 In Table 1, the D_BP and the D_RAI showed highly significant P values, indicating that the differences in the pre- and post-operative measurements for endoscopic surgery were superior and highly signifi cant in comparison to the conventional surgery, for both aging groups A and B. 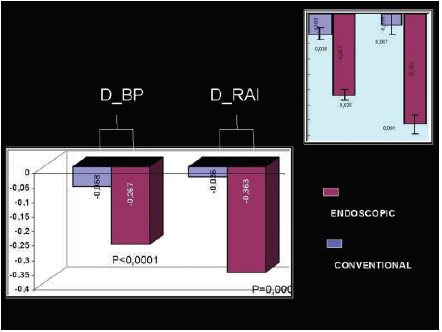 In the analysis in Table 2, comparing by surgery the D_BP and the D_RAI, the reduction of the distance with conventional surgery was not significant (column Median=0), while the reduction of the distance with endoscopic surgery was highly significant (p<0.0001 for 0001 for D_BP and D_RAI). Comparing the two techniq ues, the difference between the respective deltas was highly significant for D_BP, (p<0.0001) relative to D_RAI, (p=0.0002). Criteria Analyzed by the Evaluators. Table 3 contains the results according to nine criteria evaluated by the 5 plastic surgeo ns, by type of surgery and aging category. In the analysis of those nine criteria, the relationship between the sur gical technique employed and the category of aging was not significant (p>0.05), allowing simple comparison of the surgical techniques, independent of the aging category. Table 3: Results according to criteria evaluated by the plastic surgeons, by type of surg ery and aging category. Among the criteria subjectively analyzed by the evaluators, using pre- and post-operative photos, the criterion “restoration of malar volume and position” favoured the endoscopic method. In both aging grou ps A and B, the endoscopic technique showed a superior result over conventional technique, with a high statistical significance(p=0.0076) [Figure 4]. Table 4 shows the results, according to criteria evaluated by the plastic surgeons by techn ique, independent of aging category. 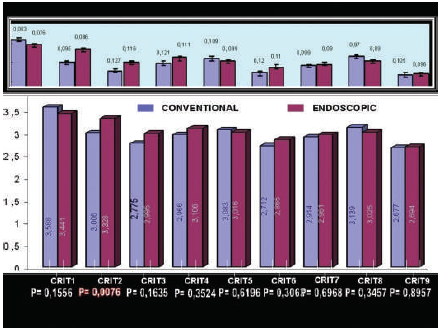 Endoscopic surgery, when compared with conventional surgery on the chosen crit eria, was superior only in the criterion restoration of malar position and volume, with statistical significance (p=0.0076). 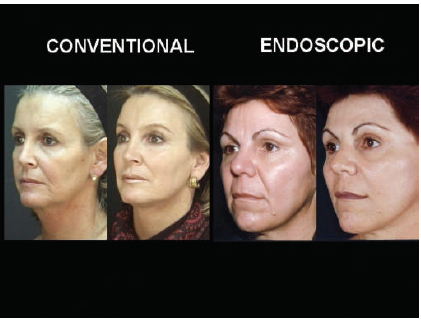 Table 5 shows the results of the criteria evaluated by the plastic surgeons, according to aging classification, independent of the type of surgery. Analyzing criterion 2 in Groups A and B, (p=0.0235), supe rior results were observed in Group B compared to Group A. The same occurred with the following criteria: distance from the palpebral rim to the blepharo-jugal sulcus, inferior palpebral flaccidity, and nasolabial face flaccidity, lateral canthus of the eyes, facial shape, and corner of mouth, all statistically significant. With both conventio nal and endoscopic techniques, better results were obtained in patients with more advanced aging (Group B, Hester types III & IV). With publication of the work by  and their new anatomicalphysiological approach, facial surgery underwent accelerated development, with scientific advancement and evolution of techniques based on the SMAS approach, using the SMAS as the support structure for a more lasting result. Prior to this, the concept of face lift rejuvenation focused on the lower face and neck, and a good result was synonymous with improved mandibul ar and cervical-facial delineation. For the newer definition of a good result, the different SMAS-platysma approa ches served well, and were very useful. forehead, and orbital, nasal and septal regions[11, 14] presented endoscopic techniques using the greatest variety of access points and planes of undermining. the orbital region, especially of the inferior portion,for its immediate proximity to the midface and central oval. 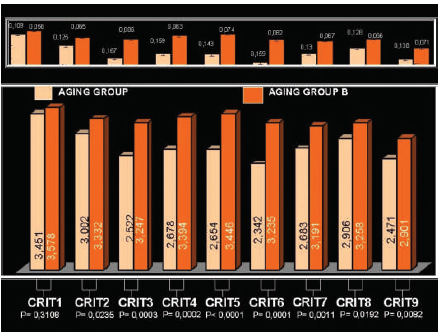 This allowed for quantification of improvement and study of the degree of significance, comparatively between the two techniques, and in relationship to the aging classification. 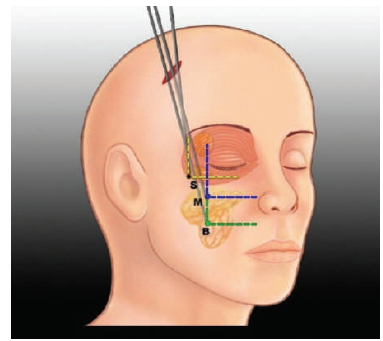 The post-operative measurements of the distance from the inferior palpebral rim to the blepharo-jugal sulcus and the inferior ray of the periorbital oval were deri ved from the pre-operative measurements, in order to determine the value of Delta, which represents the true numeri cal value of the surgical results. When comparing conventional and endoscopic surgeries by these measures, the val ue of P for the results using the endoscopic method was highly significant, showing superiority of result, as evid enced by the reduction of the distances, which were as significant in Group A (Hester types I & II) as in Group B (Hester types III & IV). It was clear how much of the difference in the measurements could be attributed to the surg ical method, as it was observed that the changes in the measurement from the lower palpebral rim to blepharo-jugal sulcus and the inferior ray were not significant with conventional surgery, but were highly significant with endos copic surgery. When compared in relation with the two surgeries, the difference was highly significant for D-BP (p<0.001), as well as for DRAI (p< 0.002). Based on these results, it was possible to objectively demonstrate the comments cited in literature alluding to the superiority of results in repositioning of the central portion of the midface along a vertical axis obtained with the endoscopic technique, and that this does not occur when employing conventional rhytidoplasty. [Figure 5, 6]. In the criteria analyzed subjectively by the evaluators, they only gave grades significant ly in favor of the endoscopic technique for the criterion restoration ofmalar volume and position, with this rating given equally to both Groups A and B. It is interesinteresting to the subjective evaluation of the criterion of the distance from the inferior palpebral rim to the blepharo-jugal sulcus was rated as `not significant´ by the evaluat ors, although objectively shown to be numerically significant. This dissonant data suggests that some new concepts for the assessing rejuvenation of the central face were not incorporated into the subjective analysis, and that obj ective studies with measurements [Figure 7, 8] can be very useful in contributing to the evolution of both the tech nique and the criteria for assessing aesthetic outcomes. When results of the criteria regarding the technique used were evaluated, only criterion 2 showed statistical significance (p=0.0076), indicating the superiority of the endoscopic surgery over the conventi onal technique in the item `restoration ofmalar position and volume.´ The effect of the subperiostal endoscopic tec hnique inconjunction with the repositioning of ptotic tissue and in the systematization developed in the eleva tion of the buccal fat pad, followed by the malar fat and SOOF,  repositions the ptotic malar region and restores the volume by the overlapping of the fatty structures, reducing the inferior portion and thus providing more conto ur contrast in the malar region. The results for Group B were graded as better in the subjective evaluations, sugg esting that the contrast was greater in tissue with a greater degree of ptosis, relative to its subsequent reposi tioning. Thus, both through objective measurement, and subjective evaluation by other plastic surg eons, the degree of improvement as shown in the pre- and post-operative photos demonstrates that the endoscopic approach to subperiosteal undermining and vertical cephalic repositioning is significantly more efficient in repo sitioning the central portion of the midface, as compared with conventional rhytidoplasty and treatment of the SMAS -platysma. In general, and as might be predicted, results were more dramatic for Hester types III & IV . It is reasonable to expect that patients with more evidence of aging will require more treatment and that the results will be therefore more dramatic. Future prospective studies will be able to analyze good indications for the selection of the endoscopic technique, based on the measurement of the inferior palpebral rim to blepharo-jugal sulcus in the different aging types, and to help predict the best techniques for achieving the most favorable aesthetic results. 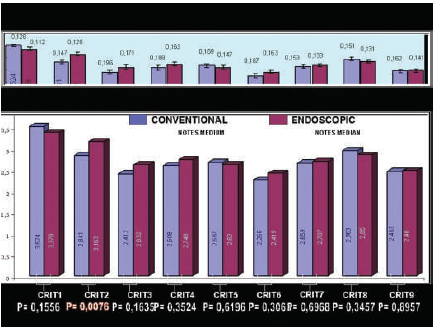 The comparison between the techniques of conventional rhytidoplasty and endoscopic subper iostal surgery with emphasis in the midface allows us to conclude that the subperiosteal endoscopic approach prese nts superiority of results compared to conventional rhytidoplasty. 1. The reduction in the distance from the inferior palpebral rim to the blepharo-jugal sulcus obtained using endoscopic technique is significantly greater than the reduction in distance achieved with the conventional technique. 2. This endoscopic technique significantly affects the restoration of volume and malar repositioning, restoring the central portion of the midface better than by conventional rhytidoplasty. 3. Group B (Hester Types III & IV), obtained more remarkable aesthetic results, independent of the technique used. Hamra ST. Arcus marginalis release and orbital fat preservation in midface rejuvenation. Congress of Plastic and Reconstructive Surgery. 1979, Rio de Janeiro:Cartgraf, 1980, p.393-396. Acknowledgement: The author wishes to thank Heather Gray for significant editorial and tran slation assistance. © 2017 Ana Zulmira E.D. Badin, This is an open-access article distributed under the terms of the Creative Commons Attribution License, which permits unrestricted use, distribution, and reproduction in any medium, provided the original author and source are credited.